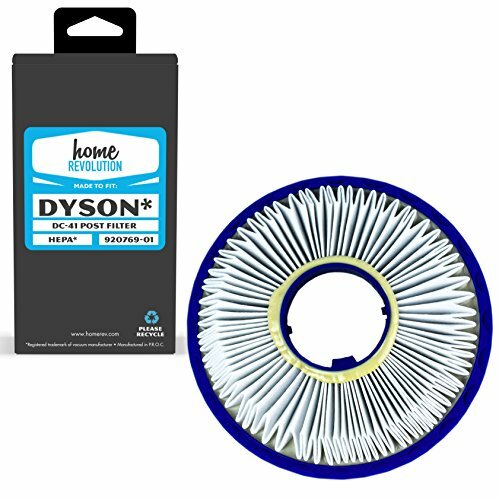 Home Revolution Brand provides High-Quality Replacement HEPA Filters for your Dyson DC41, DC65. DC66 and Dyson Ball Vacuum Cleaner. Made to Fit the following models: Dyson DC41, DC65 and DC66 Models. Compare to Part # 920769-01. This is not an OEM product and is not covered under any OEM warranty. The brand names and logos referenced here are the registered trademarks of their respective owners. Any use of these brand names, models or part number designations for this product is made solely for purposes of demonstrating compatibility. This is a replacement product carefully crafted by Home Revolution. Home Revolution filters detoxify the air and exhilarate the home and mind. With a powerful style of manufacturing, we link clean air and earth-friendly intention together. 100% fresh air and satisfaction or your money back! This is a replacement product carefully crafted, a HOMEREV (TM) Brand. HEALTH: Dirty filters can impact respiratory health long-term. ENERGY & EFFICIENCY: A dirty filter causes the unit to work harder to do its job. EXPERT TIP: Energy Star recommends changing your filter a minimum of every three months, with the ideal being every monthﾗespecially in the wintertime. You want a high-quality, low-cost air filter that removes particles, resists airflow and improves the expected life of your HVAC, refrigerator, air purifier, humidifier, furnace or car. If you have any questions about this product by Home Revolution, contact us by completing and submitting the form below. If you are looking for a specif part number, please include it with your message.